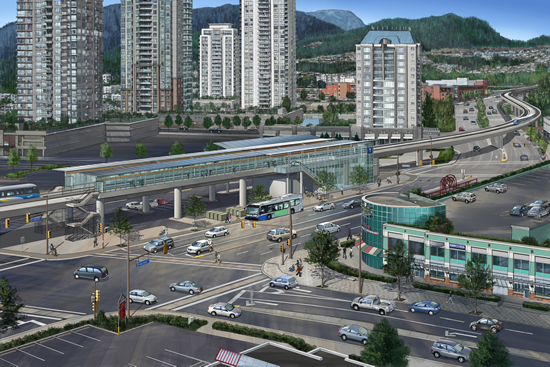 A consortium led by SNC-Lavalin has been awarded an $889-million contract to design and build Metro Vancouver’s latest rapid transit line — the Evergreen Line from Burnaby to Coquitlam. The provincial government says major work on the SkyTrain extension will begin next month and the line should be running by the summer of 2016. The consortium is called EGRT Construction, and besides SNL-Lavalin, it includes Graham Building Services, International Bridge Technologies Inc. and Jacobs Associates Canada Corp., as well as other companies. The government says the consortium will build the elevated and ground-level guideways, a two-kilometre tunnel, seven stations, power stations and train operating systems. A community outreach team has also been set up to keep local residents and businesses informed about the progress of the project. Construction of the region’s last major transit link — the Canada Line to Vancouver International Airport — sparked a lawsuit from store owners who claimed their businesses were hurt when the street in front of their operations was dug up to bury the line.